Catch up on your state trivia with these Nevada history firsts and interesting fun facts about the state. 1828 - The first recorded white men in the Elko area were fur trappers who trapped beaver in the area starting. 1843 and 1844 - John Charles Fremont led the first thorough exploration of the Great Basin, which includes most of Nevada, in 1843 and 1844. 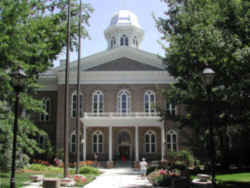 1859 - Nevada was made famous by the discovery of the fabulous Comstock Lode. Its mines have produced large quantities of gold, silver, copper, lead, zinc, mercury, barite, and tungsten. 1862 - While Samuel Clemens took the penname "Mark Twain" as a reporter working for the "Territorial Enterprise," he began his writing career as a reporter in the Midwest some years before moving to Virginia City. 1864 - The longest morse code telegram ever sent was the Nevada state constitution. Sent from Carson City to Washington D.C. in 1864. The transmission must have taken several hours. 1870 - Virginia City, founded when the Comstock Lode was discovered, was home to 20,000 people at its peak in the 1870s but now has only about 800. 1899 - Charles Fey invented a slot machine named the Liberty Bell. The device became the model for all slots to follow. The Pair-O-Dice Club was the first casino to open on Highway 91, the future Las Vegas Strip. In March 1931 Governor Fred Balzar signed into law the bill legalizing gambling in the state. Construction worker Hard Hat's were first invented specifically for workers on the Hoover Dam in 1933. 1938 - The Virginia City steam train still operates and was featured in the Imax project "Mark Twain's America." The "steam train" is a modern-day tourist train and does not link back to the original Virginia & Truckee RR which had its last run to Virginia City in 1938. 1959 - The longest running show in Las Vegas is the Follies Bergere at the Tropicana Hotel and Casino. It opened in 1959. The production numbers in "Showgirls" were written specifically for the Paul Verhoeven film and shot in the Horizon Hotel at Lake Tahoe. The bulk of the movie used locations located at the Luxor and the Forum Shops at Caesars. There were 16,067 slots in Nevada. 1976 - You see the name Hughes on numerous locations and developments. Howard Hughes bought up considerable Nevada property before he died in 1976, including the following hotels and casinos: Castaways, Desert Inn, Frontier, Landmark, Sands, Silver Slipper, and Harold's Club. Part of the Hughes legend was recounted in Jonathan Demme's "Melvin and Howard." 1999 - Nevada had 205,726 slot machines, one for every 10 residents. Nevada is the driest state in the nation with an average annual rainfall of only about 7 inches. The wettest part of state receives about 40 inches of precipitation per year, while the driest spot has less than four inches per year. During the Cold War, the US Atomic Energy Commission chose a Nevada site to test nuclear weapons. Berlin-Ichthyosaur State Park near Gabbs has fossils of ancient fishlike reptiles. Nevada is the gambling and entertainment capital of the United States. Hoover Dam, near Las Vegas, impounds the waters of Lake Mead, one of the world's largest artificial lakes. Once the highest concrete dam in the world, Hoover Dam offers guided tours and a museum of artifacts of the construction and its workers. In Tonopah the young Jack Dempsey was once the bartender and the bouncer at the still popular Mispah Hotel and Casino. Famous lawman and folk hero Wyatt Earp once kept the peace in the town. Berlin-Ichthyosaur State Park is constructed around the fossilized remains of ancient, mysterious reptiles within a well-preserved turn-of-the-century Nevada mining camp. Austin's oldest church, St. Augustine, requires the establishment's bells in the tower to be rung by pulling a rope located in the men's restroom. Locals use terms like The Sagebrush State, The Silver State, and The Battle Born State as nicknames for Nevada. Grammatically, the proper term for the mountains is the Sierra Nevada not the Sierras. Robert Conrad almost called one of his television series High Sierra Rangers but changed it to High Mountain Rangers. Wayne Newton owns a home in the Las Vegas area, and it was a real location for the film "Vegas Vacation." Misfits Flats off Highway 50 near Stagecoach takes its name from the John Huston film. Huston used the privately owned area to film a complicated wild horse round up with Clark Gable, Marilyn Monroe, Montgomery Clift and Eli Wallach. The state has about 50,000 miles of paved road, much of it featured in films like "Vanishing Point," "Breakdown," "Rainman," and "Lethal Weapon 4." Hoover Dam, the largest single public works project in the history of the United States, contains 3.25 million cubic yards of concrete, which is enough to pave a two-lane highway from San Francisco to New York. The dam face was used in an amazing stunt for Roland Emerich's "Universal Soldier" and has been seen in such films as "Viva Las Vegas" and "Fools Rush In." Nevada tribes include the Shoshone, Washo and Paiute. Tribal lands have been used in such film projects as "Misery," and "The Greatest Story Ever Told." The Las Vegas Strip is actually under jurisdiction of Clark County and can be seen in just about any film set in the city. Nevada is the only state with an entire museum devoted to the life and time of entertainer Liberace. Writer and commentator Lowell Thomas called Elko the last cowtown in America. Elko is the home of the annual Cowboy Poetry Gathering. Area 51 is acknowledged with State Route 375 officially christened "The Extraterrestrial Highway" in a ceremony featuring the director and cast of the movie "Independence Day." The highway runs between Alamo and Tonopah. There is a tiny restaurant stop at the Little Ale' Inn at Rachel. The only Nevada lake with an outlet to the sea is man made Lake Mead. 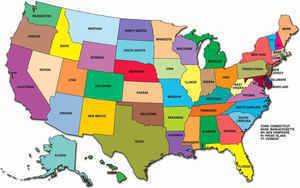 To drive from Los Angeles, California to Reno, Nevada the direction traveled is to the west. Las Vegas has the majority of the largest hotels in the world.